Successfully Added H100 Racing RC Boat - 30km/h, 150M Range, Self-Righting, 4Ch 2.4GHz Wireless Control, 600mAh Battery to your Shopping Cart. The Skytech H100 racing boat brings you fast-paced adventure on the water. Its sleek design and powerful motor will get you many envious looks as you cruise across the water at up to 30km/h. This RC speed boat has right and left side navigation rudders that improve stability, but should it capsize you won't be stuck as the flipping function ensures you can right it easily. The transmitter has switchable throttle and the LCD screen feeds you all the telemetry such as trim, throttle information as well as battery life and signal strength. With a 150meter range and 600mAh built in battery this fun racing boat makes a great gift for young and old alike and is a perfect introduction to for beginners. 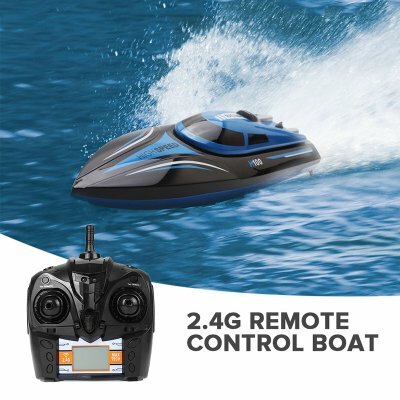 This RC boat comes with 12 months warranty, brought to you by the leader in electronic devices as well as wholesale cool gadgets and RC toys..